What is going to be the market? Surely I hope he understand that he will become a backup somewhere. I wouldn't mind signing him to a 2 year deal here to backup Winston would be great. I mean if its true that we offered Glennon 7 Mil, RG3 may jump at anything remotely close to that. I think it would be a perfect replacement for short term if anything happened to Winston. I'm not sure anyone signs him now. His career may be coming to a close. Ryan Griffin has 2 years in the system. We're good. I am curious what you think he offers other than being a former high first round draft pick that nobody wants? Bootz2004 wrote: Ryan Griffin has 2 years in the system. We're good. When I look up stats on Griffin this is what I found : http://www.espn.com/nfl/player/stats/_/id/16140 "No stats available." Ryan Griffin has not had a snap under center in a regular season NFL game. Are you seriously going to tell me that you are comfortable with the fact that he just KNOWS the system? The guy held a clip board with no pads all of last year, when this team only suited up 2 QBs for games. Weather its RG3 or anyone this guy should not be our fall back if anything happens to Winston. Definitely needs Veteran competition and if RG3 is at the price I am good with that. Weather its RG3 or anyone this guy should not be our fall back if anything happens to Winston. Defiantly needs Veteran competition and if RG3 is at the price I am good with that. No. He's telling you he's not comfortable with RGIII carrying the clipboard. PanteraCanes wrote: I am curious what you think he offers other than being a former high first round draft pick that nobody wants? He is a player with starter and in game experience. Very hard to find. Nobody wants to make him the franchise guy, but he is talented, and fits the mold of a perfect backup. Exactly. Has more to do with RG3. Why should I have more confidence in him or any backup for that matter that he'll be able to win games or won't himself get hurt if Winston gets hurt? Honestly, I can't think of another player that had a larger fall from glory than RGIII. After that first year, everyone thought the Redskins were brilliant and almost questioned the Colts decision to take Luck over him. Then, every single game for the rest of his career happened. What a sad sad story. We'll always wonder what could've been had he not trashed his knee at such a young age. edit: Unreated to RGIII, but I just gotta say how crazy it is that Luck has become a non-factor in the league. He was praised as being the second coming on Manning. Instead, he's just kind of been a JAG. Last edited by LUGZ on Fri Mar 10, 2017 1:38 pm, edited 1 time in total. I'm glad you aren't the GM. You'd have us trading up into the top 10 for a RB and giving RG3 a $7M contract! I would also jump if you offered me close to $7MM. That doesn't mean that's a good plan. The writing was on the wall since the trade for Osweiler. 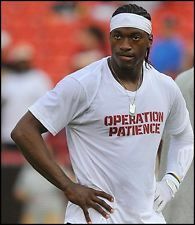 I wish RG3 the best in his life after football. Remember that one time when folks were convinced RGIII was more gooder than Andrew Luck? Eh.... is "changed teams" really a big deal? Rookie deal is 4 years with a 5th option. This is the offseason after their 5th year. LUGZ wrote: but I just gotta say how crazy it is that Luck has become a non-factor in the league. He was praised as being the second coming on Manning. Instead, he's just kind of been a JAG. Considering the hype surrounding him, that is kind of just "meh". He just hasn't taken over the league like many predicted. And he certainly never stepped out of the shadow of #18. Well that is why I wonder what the market is for him. 7 Mil I agree is way to much. But if we honestly offered Glennon 7 mil a yr to offer RG3 A 2 year 8 Mil with that second yr being a option, it would not be crazy. Also if he shines in the Pre Season or shows any glimpse at anytime that can make him trade bait, so why not? Lets not kid ourselves into thinking that if Winston went down 2 to 3 games this season, Ryan Griffin gives us a better chance of winning temporarily than that of RG3. Almost any available free agent QB that has had starts as a NFL QB has a better chance than Ryan Griffin to fill in. Last edited by BucaRican on Fri Mar 10, 2017 3:31 pm, edited 1 time in total. If Winston is injured we are done anyway. RG3 would not fix that. Teitan wrote: If Winston is injured we are done anyway. RG3 would not fix that. Ryan Griffin certainly would put a nail in the coffin. People keep saying stuff like that. A good backup isn't about being able to take over for an injured starter and win the Super Bowl. A good back up is about going 1-1 rather than 0-2 during the season when one loss is the difference between playoffs and waiting for the draft. The last two Super Bowl winners had to get starts out of their backups during the season. Brock went 4-3 in games he started and finished. One less win and they have the same record as the Chiefs, don't get a bye and possibly become a wild card team. Litch seems to really like Griffin. I don't think we're making many changes there. RG3 though, wow.... still the greatest draft trade fleece of all time imo. It's not just Licht, Koetter seems to like him a ton too. They carried him as a 3rd QB on the roster for the last two years. I trust that they have an idea what they are doing. He'll get far more work in the system now with Glennon gone too. BucaRican wrote: Also if he shines in the Pre Season or shows any glimpse at anytime that can make him trade bait, so why not? Yep. His attitude is not welcome. Not the guy you want around Winston. They also remember to speak with proper ***damn grammar you hick!! !